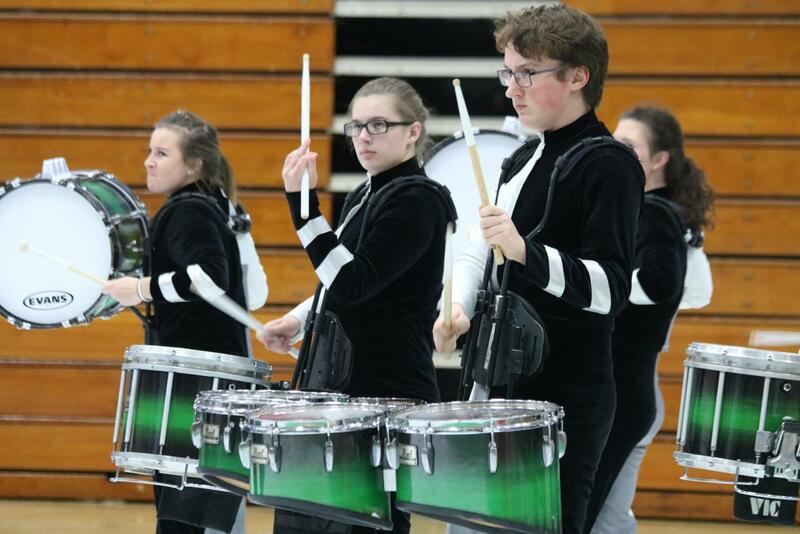 Martinsville High School’s Indoor Winter Percussion scored a first place win on Saturday, February 17th at their first competition at Franklin Central High School. Martinsville placed with a score of 71.6 in B class on week one. The group, consisting of 22 people overall, performed at 1:45 p.m. on Saturday. Another strike of pride for the group is that they are not fully done with their show yet, so only time will tell if they can maintain the effort, work, and devotion to their show as they proved they had on the 17th. Indoor winter percussion is an extracurricular activity offered by a copious amount of high schools across the U.S. As stated in the name, the activity takes place during winter time and is all percussion instruments and players which are broken down into subsections within the group itself. The subsections include tenors, snares, bass drums, and a cymbal line within the drumline. The front ensemble consists of marimbas, vibraphones, bells, xylophones, and a varying degree of auxiliary percussion. Usually there are leaders of each section who provide the integrity and responsibility to lead those sections on and off the floor. Martinsville’s drumline captain Wesley Kopis and front ensemble section leader Julia Rito lead the group on and off the floor and have had a riveting experience to say the least. Kopis and Rito have high hopes for the season and hope to fix mistakes or issues the group had experienced on that Saturday. “There’s definitely a lot of room for improvement; there always is, but I’m excited to see where the Martinsville Drumline goes this year,” said Rito. Drumline captain Wesley Kopis said, “We have to make sure and work on that the front ensemble agrees with the drumline and vice versa and that we have to be a bit more internalized.” Both Rito and Kopis are excited for the rest of the season and both have high hopes of keeping the winning streak going throughout the rest of the season. Winter Drumline did a great job this season. Congratulations to everyone of The Drumline participants!